I'm lucky to have "in-laws" who love Asian food as much as my other half and I do. It means that when we go to visit them for the weekend that we can have chinese or thai. There are many good chinese restaurants in Waterford, but I've been longing to try the new-ish Sabai Thai and Vietnamese restaurant for quite a while. 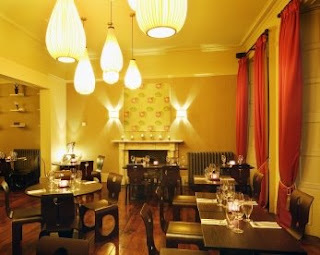 The restaurant in located in an old building and the period features have been preserved in the fashionable dining room. The room is luxurious with heavy curtains, dark walls, restored floorboards and fabulous lighting. An outdoors terrace was closed, but would be lovely on a wam summer's day. The lunch menu features about 6 starters (E4.50 to E7) and about 15 mains (ranging from E12-E18). The in-laws shared a mixed plate of starters (actually meant for one person, but it turned out to be very generous), while we had Tom Yam soup and Ga Xe Phay salad. The salad is a mix of cucumber, carrot, beansprouts, coriander, chilis, chicken and prawns which has all been tossed in a tangy lime and fish sauce dressing. The portion size was excellent and the clean, fresh and spicy taste really whetted my appetite for the mains. The soup was delicately flavoured with galangal and lemongrass and featured two plump prawns at the bottom of the bowl. For mains, I chose the jungle curry made with prawns. The waitress asked if I would like it spicy or hot ?? That confused me for a while. Other mains included Phad Med Ma Mung (a cashew-nut based stir-fry with meat of your choice) and the Phad Ka Pao (a chili and basil stir-fry with meat of your choice). All mains were delicious with the cashew-nut Phad Med Ma Mung being a strong contender for favourite. I wasn't too keen on my jungle curry as it featured a strong flavour of star anise, which I am personally not too mad about. It was however, hot, and full of prawns and crunchy veg. Three starters and four mains cost E63, which isn't bad value at all for delicious food in gorgeous surroundings. The food was authentic and flavoursome. For those people who like value for money, the portion sizing is on the generous size. Hotpress magazine weren't far off the mark at all when they named Sabai as a restaurant of the fortnight. I think that the word "Sabai" means "happy" or "comfortable", and you will defintely feel quite pleased after a trip to this Waterford restaurant. Cometh the Hour, Cometh the Man! Fancy Some Roasted Pig? Oink If You Do!